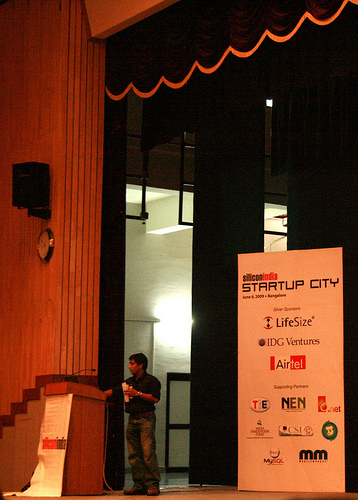 As planned, I had been to Startup City 2009 today. I reached at 9am sharp and was surprised to see the place filled with people. I found it hard to find a parking spot and there were quite a few cars lined up because the parking was full. I didn’t have any problems with registration as they had a separate registration counter for bloggers, press and exhibitors. I would estimate the turn-up to be more than 3000. 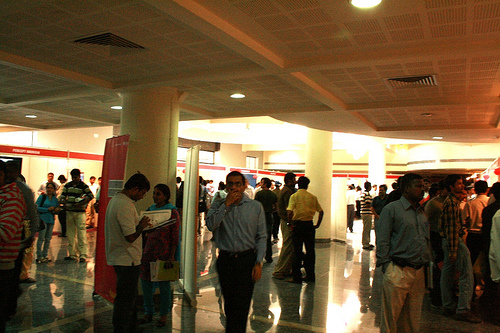 More than 100 startups had put up stalls in the event. 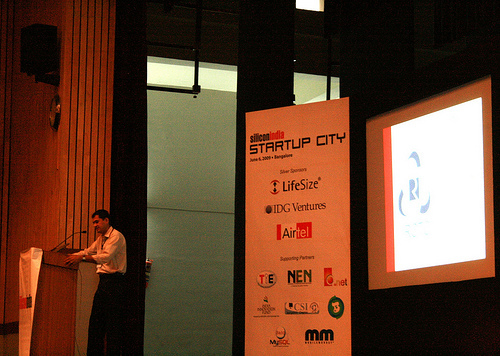 The event started with a keynote from Naukri.com founder, Sanjeev Bikhchandani. Sanjeev also mentioned how people have to make personal sacrifices for the success of the company, and how persistence becomes one of the important qualities of an entrepreneur. It’s not the idea or the brilliance that matters, it’s the persistence. Then there was a keynote by Ajit Balakrishnan, founder of Rediff. This was my favorite keynote among all. Ajit started off talking about trivia from his personal life, and about how he used to build UNIX boxes once upon a time in Bangalore. He also described how businesses have to keep reinventing themselves every 2 to 3 years. Ajit gave the example of the horseless-carriage and how it evolved into the modern car, although the horseless-carriage design stayed with the car for quite some time. He thus showed, how every industry looks like the old industry for quite some time. Today, things have changed a lot. We have the introduction of things like BigTable/Hypertable for storage. He returned to his example of the horseless-carriage, saying, it took 10 years for the horseless carriage to change to a car. The breakthrough came from Henry Ford, 20 years after the invention of the horseless-carriage. The Internet is also going through this and we are just coming out of the horseless-carriage era. Rediff in India still mimics the newspaper look because of the way the Internet is structured – most successful portals are that way. However it has a very different design on the mobile. The whole world is moving towards the mobile. The revenue model here is yet unclear; putting traditional ads on the mobile doesn’t work. Rediff is going through a dip, but it’s recession, so it’s fine! Rediff now has the US site design similar to their mobile version, but this is not the end. Mobile as the primary medium for accessing the internet for consumer applications is going to be the next big thing. Social networking is going to be big. Have product managers and developers sit next to each other. You should think about making your company profitable, but not buying a Rolls Royce for yourself. Look for inflection points – Rails solved the O/R problem very well. So did Kindle. Then it was Mukesh Singh from Amazon India. Mukesh started with a few facts about Amazon and Amazon WS’s. He mentioned how Amazon started its business and then exposed their platform which now gets them 30% of their revenue. Then there was a keynote from Bakshish Dutta. Bakshish described the Sun Startup Essentials program. With its presence in 31 countries, the program receives more than 500 startup applications every month. There were a couple of keynotes that I could not attend as I planned to visit the stalls during this time. Among the stalls, I found the ones from Neev Technologies, VidTeq, MapMyIndia interesting. There were a few others like the ones from Amazon that drew attention. I reached late for the post-lunch sessions. There were 4 parallel tracks: Internet/Mobile/Services/Software. I decided to attend the Internet track. When I reached the auditorium, Ritesh’s (Ritesh is from IDG Ventures) talk was in progress. Ritesh was explaining how they evaluated companies and how they had a few hypotheses and how some of them they still agreed with and some of them were proved wrong. In the ad model 1 $ per user per annum is what is realistic. The amount of money spent in acquiring and retaining users might cost more than that unless you have a brand name. Soft goods – You know what you are getting and delivery is not an issue. For physical goods, the margins are very low. But there could be certain physical goods where margins can be high. Ex: Myntra. We thought that for rich media content streaming, bandwidth is going to be an issue. It appears like it is not a constraint: Youtube is one of the top sites in India. The actual issue with startups in this area is that there is no significant local differentiator, and cost of serving this content is high. Then there were startup presentations. 14 startups presented their ideas, each taking 10 minutes. Competitive landscape: Dominated by free lancers and small companies. No big player. Poor service and poor platforms. Problem with current map solutions is that in India, these maps don’t work. Many cross roads and main roads don’t have a sign. Vidteq provides a video clip of the complete route. Value added distributor of financial products for the Indian Retail Investor. Provide value added financial services. Plan your financial future – invest – track. I was exhausted by the time these sessions ended, so I returned home. The sheer scale and the way the event was managed. Hats off to SiliconIndia. They did a good job. The exposure given to various startups and people who were interested in them. The ideas that were thrown around and the event organization. There were just too many stalls and too many presentations to be assimilated in a single day. It could have easily been a 2-day event. Some of the keynote presentations seemed to only try and market their own company and products without stressing on how it fits into the context of the event. Overall it was a good event and I thoroughly enjoyed it. 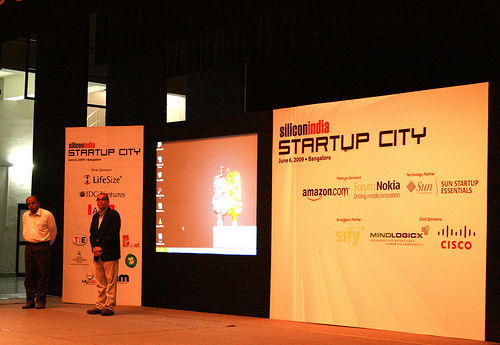 Previous Previous post: Startup City 2009 – Be there!